W. Bro. 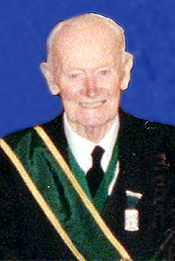 Jim MacKinnon P.M.
Dr James Alan MacKinnon was born on April 13, 1916 in Oldham, Lancashire, the eldest of three children. He was the son of a Dr Ronald MacKinnon, a Skye man, born in Staffin, who had moved to Oldham to practise medicine. His uncle, Dr Murdo MacKinnon was a Skye GP, known locally as Dr Beag, 'the little doctor'. Jim MacKinnon was educated at Manchester Grammar School and later went on to Glasgow University, to study medicine.Prior to the Second World War, in his spare time, Jim was an active member of the Territorial Army. He met his wife to be, Josie, at the University and they married two days after the outbreak of hostilities, in September 1939. World War 2 interrupted his medical studies and he signed up for the Army to fight for his country. He served in the 7th Armoured Division in the Tank Corps, becoming a Tank Commander. He served in France and was involved in the memorable evacuation of Dunkirk in 1940. Troops in his Division were some of the last to leave and he himself narrowly escaped, by using an inflated rubber ring inner tube, to reach one of the rescue vessels. In 1942 he received the sad news of the passing of his father, Dr Ronald. He had been a victim of World War I, where he had been gassed, resulting in his lungs being severely burnt. Soon after Jim was posted to Egypt and, as part of the 7th Armoured Division, became known as one of the famed Desert Rats. In 1943, during a campaign, his military service came to an abrupt halt, when his tank was hit by a German shell. A large number of his crew were killed and Jim suffered serious leg injuries. This necessitated major surgery and a period of convalescence in a military hospital in South Africa. The injuries left him permanently disabled. However Jim was of such a character that he never openly let things get him down and was always of a cheery disposition.